This broccoli cauliflower salad recipe makes a welcome addition to any party, potluck, holiday, or weeknight meal. The combination of flavors - crunchy broccoli and cauliflower, sweet pecans and dried cranberries, salty bacon, and creamy dressing - are like a party for your mouth. Look for prepared glazed pecans in the produce or nut section of your favorite supermarket. Emerald is one brand. Or you can make your own spiced pecans. Make sure broccoli and cauliflower florets are cut into small, bite-sized pieces. This not only makes the salad more appealing; it helps the flavors meld better. Place broccoli, cauliflower, pecans, onions, and cranberries in a salad bowl. Toss. Whisk together the dressing ingredients. Pour over the broccoli-cauliflower mixture, and toss to coat the salad evenly with dressing. 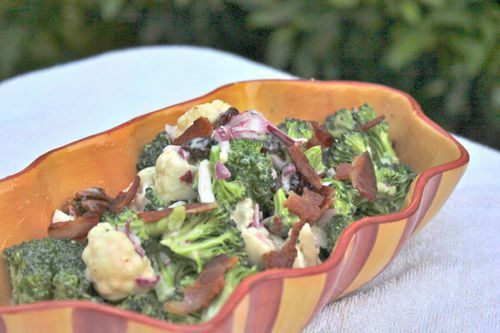 When ready to serve, crumble the bacon over the broccoli cauliflower salad.